[UPDATED] Chinon have put a rather mysterious announcement on their website. 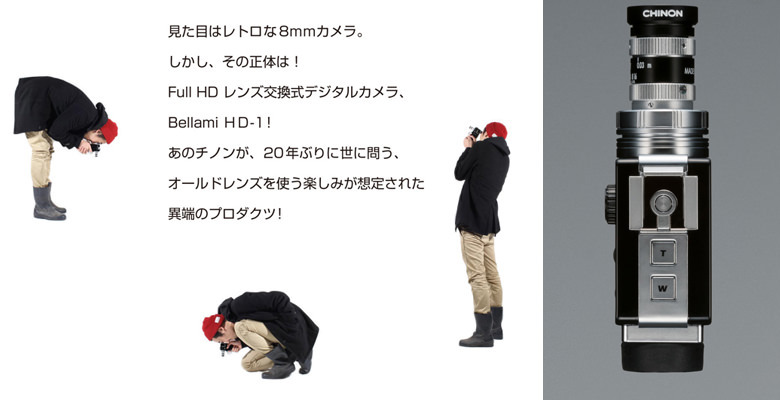 The page doesn't do anything else than reveal the looks of their new Bellami HD-1 camera. 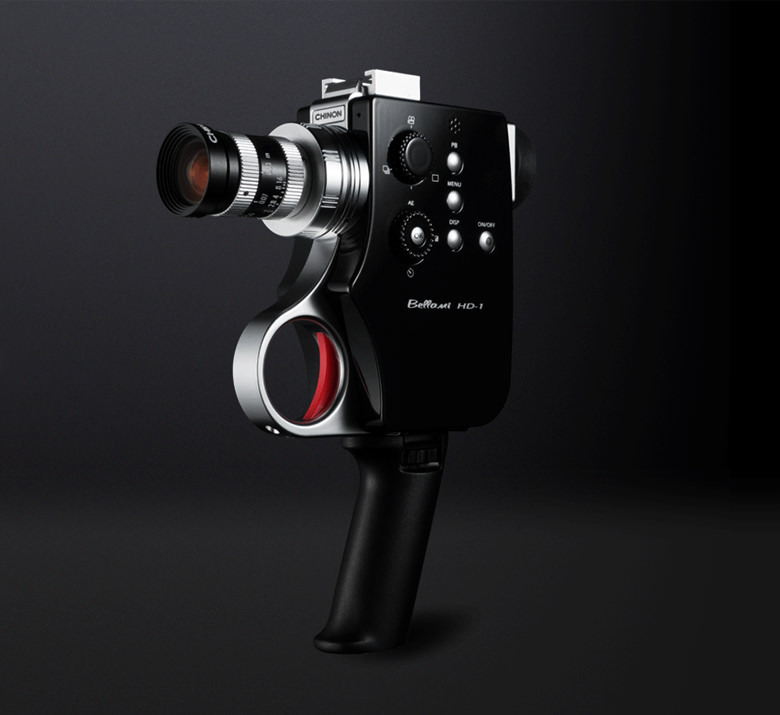 A pistol-grip retro style FullHD 1080p camera. There's absolutely no specifications on the website or details whatsoever, so everything that follows is pure speculation. The updated information can be found at the end of this post! The camera looks to be a retro-style camera with interchangeable lenses. If this is true, then my best guess is that it'll sport a 8mm sensor, opening up a whole new world of lens-choices since there are tons of extremely cheap 8mm lenses out there. The camera looks actually pretty solidly build - with a very rigid hot/cold-shoe mount on top. The encasing (as far as this product image can tell us) looks to me like some glossy-finish ABS plastic wrapped around a metal frame. It seems like it is not a dedicated video camera, but also sports two photo-modes: Single shot and burst/continuous mode. On the bottom of the metal frame is a removeable pistolgrip, so the camera can be mounted to a tripod as well. As EOSHD already put it - the red trigger looks to be relatively cheap, but we'll have to wait and see. As far as this image can tell us, the camera doesn't have a monitor, but does sport a EVF, right where it should. I'm keeping my fingers crossed for a 8mm sensor - and at that size it shouldn't be impossible to make it a global shutter CCD and still keep it affordable. This would make the (for me) perfect one-stop camera for personal use. Another website popped up showing the camera in the hands of a user. It also now is confirmed: this is a 8mm sensor! Also, in the hands of an actual user you can appreciate how positively tiny this camera is. With this size, I'm now hoping it'll be a full metal casing to give it at least some weight. If there's anyone out there speaking Japanese - please be so kind as to post the translation in the comments, or even better - contact me directly via e-mail! It will support D, C, CS and M42 mount lenses. It is unclear at this point if this is via interchangeable lens mount, or via adapters. It will hit the (Japanese) shelves in a few weeks (mid-March).